I said, heaven is this place where everyone, from those who hunger and thirst for righteousness to those who are persecuted for righteousness sake, are truly blessed. Heaven is a place where everyone has given up on anger. It’s a place where everyone has come to see the futility of hatred and decided to love their enemies. It’s a place where the instruments of warfare have been converted into the implements of agriculture. Heaven is a place where the need to climb the ladder of success has lost its appeal and no one worries about financial security or owning stuff. Everyone prays, “give us this day our daily bread,” and everyone shares what has been given. Heaven is a place where no one tries to decide whether or not any of the other residents should be there. The need to judge others has long since passed away. Christians have stopped judging Muslims. Palestinians have stopped judging Israelis. The poor have stopped judging the rich. The right has stopped judging the left. In Christ there are no “judgy” people. Heaven is a place where “the Spirit and the bride say come,” and all who are thirsty gather to drink the water of life. Because heaven is, after all, the city whose gates never shut, where anyone who wants to enter, can. Sure, there will be some who, like the elder brother, refuse to go in. But in the end, who can resist a party? Heaven is a place where all kings and nations have gathered under the tree of life to find healing in its shade. Finally I said, would you like to go to heaven? 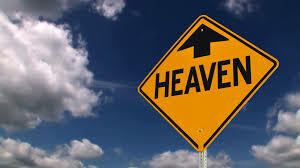 Slowly, reluctantly at first, then more willingly and then more joyfully and fearfully, most of the religious leaders agreed that going to heaven would be a good thing. So, we prayed together and we walked out the doors of the place where we had gathered and we took our first tentative steps into the kingdom of heaven. Then I woke from the heavenly dream that is, according to Jesus, even now becoming a present reality.